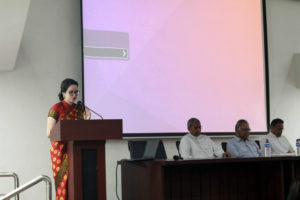 A one day Symposium on “Funding Opportunities for Research Grants and Higher Studies in India and Abroad” was held on 3rd April, 2019 at Tapesia Campus. There were three prominent speakers in the symposium – Prof. Pawan Sharma, DBT Research Professor from College of Veterinary Sciences, Khanapara, Guwahati, Dr. Sukhomay Pal, Co-Coodinator, TOCIC IIT Guwahati who is also an Associate Professor in the Department of Mechanical Engineering, IITG and Dr. Samrat S. Kumar from Country Representative of EURAXESS, India. 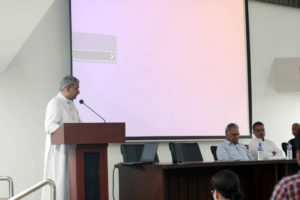 The speakers gave insight into the many opportunities for research grants and higher studies which are made available by different government departments in India and also by European Commission. 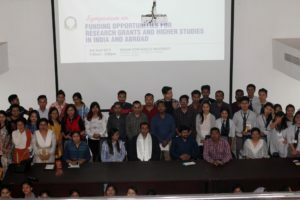 University and College teachers, Ph.D scholars and master degree students from different institutions of Guwahati including IAAST, Cotton State University, AIMT, NERIM and Don Bosco University attended the symposium.